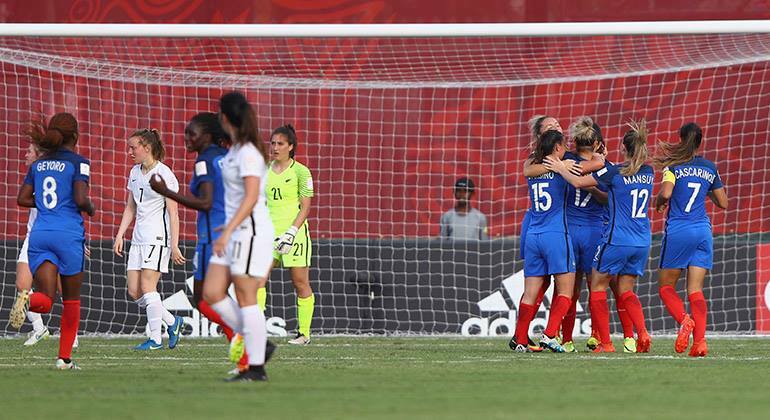 New Zealand’s hopes of a second straight appearance in the FIFA U-20 Women’s World Cup quarterfinals have ended with a 2-0 defeat at the hands of France. A win over the highly fancied Europeans would have guaranteed progression into the knockout stages and a draw might have also secured a place in the eight as long as USA avoided defeat to Ghana – which they did with a 1-1 draw – but a coolly-taken goal from Marie-Charlotte Leger in the 16th minute gave the Kiwis an uphill task. New Zealand finished the first half brightly with substitute Emma Rolston adding a spark up front, but France stretched their lead shortly after the restart through Clara Mateo’s short range strike. The loss of Rolston through injury in the 51st minute was a further blow to New Zealand’s chances but they rallied and mounted a period of sustained pressure midway through the spell with chances falling to Jasmine Pereira, Tayla Christensen and Martine Puketapu. The best of those fell to Pereira who ghosted behind the French defence to meet a quickly taken Daisy Cleverley free kick but the unmarked Football Ferns striker couldn’t make full contact. After a campaign that saw his side beat Ghana in their first match and put in competitive showings against USA and France, New Zealand coach Leon Birnie was in reflective mood after the match. “Mixed emotions tonight, disappointed to be going home but proud of the girls and the performances they have put in,” he said on Twitter.